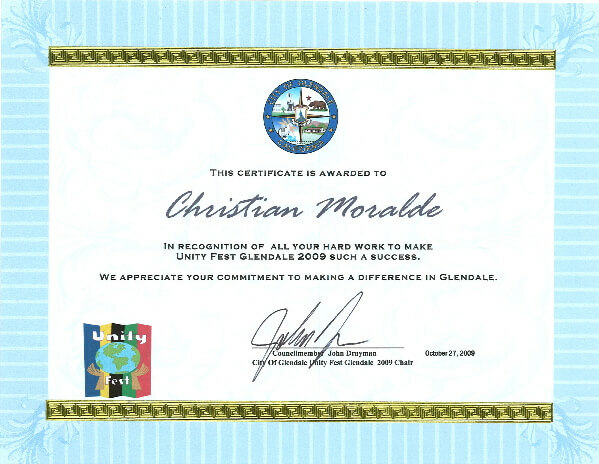 The City of Glendale California, Arts and Culture Commission has invited media personality, Christian Moralde to host the 8th Annual Unity Fest on October 11, 2009. Unity Fest in an annual celebration of ethnic and cultural diversity which recognizes the importance of arts to the quality of life and the local economy. With attendees reaching over 16,000 individuals, Unity Fest is one of the leading public street festivals in the state of California.